On 8 July 2015, in a pervasively ignored but historically very important news event (briefly mentioned by the BBC), the only trial ever in which a former head of state was convicted in his own country for genocide — in the long court case of Ronald Reagan’s friend Guatemalan General Rios Montt — finally petered out via a declaration by a Guatemalan court, alleging that Montt’s 10 May 2013 Guatemalan conviction and 80-year prison sentence (never served) for genocide, must now simply be abandoned, because Montt is supposedly «mentally incompetent to stand trial». Though a retrial of his case had been promised, it probably won’t happen. Guatemala’s aristocracy seem to have blocked any and all penalty for their General and former President’s genocide. The pro-aristocracy Constitutional Court of Guatemala had ruled on 20 May 2013 to throw out General Montt’s conviction for systematic genocide to exterminate entire villages of Mayans, exterminating them in order to keep in power Guatemala’s mainly Spanish-derived aristocrats, commonly called the nation’s «oligarchs». 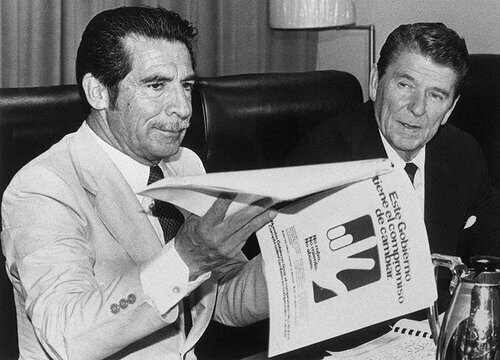 Montt had been supplied the weapons and financial backing for his genocide by Ronald Reagan’s U.S., and by Menachim Begin’s Israel, and none of those tyrants was executed or imprisoned either. The Reagan Administration had arranged for Israeli weapons to be sent to the Guatemalan Army to carry out the genocide, because doing it this way (instead of by using U.S. weapons) would reduce congressional involvement and consequent possible U.S. news-media coverage of this Guatemalan-American-Israeli genocide of Guatemalan Mayans. Like in the Iran-Contra affair, Reagan found weapons-shellgames around Congressional oversight. The story about the Guatemalan genocide and trial was reported on 20 May 2013 by Consortium News Service, in an interview, by Dennis Bernstein, of the independent investigative journalist Allan Nairn, who had reported on the genocide and on Montt’s trial and conviction. As Nairn said, «It’s the first time that any country has been able to prosecute a former president for genocide using its own domestic criminal courts». When the U.S. tried Hitler’s officials in the Nuremberg Tribunals after WW II, it was only a foreign power, victor’s justice, that judged and imposed verdicts and punishments. Guatemala was now going to be the first nation to try and convict its own former head-of-state for genocide, albeit in a much smaller case than that of Hitler’s Germany, but the precedent here would have been the most important thing, and it was blocked. Aristocracies in that country and others succeeded in preventing such a historic precedent to be set — for aristocrats to be democratically legally tried and convicted by and in their own country, for mass-murders of their countrymen. Such a precedent would threaten aristocrats everywhere, far more than mere assassination does, and it has now been successfully blocked by aristocracies. More can be read about the case at the International Justice Monitor. As that report makes clear, Guatemala is a corrupt country (like any aristocratically controlled nation is), and so achieving any real justice there is difficult in any case, but especially in cases where the crime that is being charged was carried out on behalf of the aristocracy — the dictatorial clique that the government actually serves. So, a case such as this one tests whether the given nation is an aristocracy, or is instead a democracy (one that serves the public). Guatemala, evidently, remains a dictatorship. The trappings of elections there are only for show. Maybe Greece, Ukraine, U.S., and many other countries, are like that, too. Other than Ronald Reagan, the only U.S. President to sponsor a genocide in a foreign country has been Barack Obama, in Ukraine. That case is also being ignored in U.S. ‘news’ media, and in the ‘news’ media of allied countries — countries whose aristocracies accept being subordinate to America’s aristocracy. On 21 November 2014, the Obama Administration additionally made the U.S. one of only three nations in the world to vote against a U.N. resolution condemning genocide, racism, and Holocaust-denial; even Israel and Germany didn’t join the U.S. that time, because Holocaust-denial was included in the condemnation. And even that historic (in a monstrous way) vote was generally ignored by the U.S. ‘news’ media. Americans aren’t supposed to know that though their country fought German nazis in the 1940s, it blocks condemnations of all nazis now. The West’s alleged ‘support of human rights’ is so selective regarding which aristocracies it condemns and which victims it supports, and which genocides it supports and which ones it opposes, so that anyone who doesn’t think it’s sheer hypocrisy instead of authentic humanitarianism as it’s claimed to be, is either ignorant of history, or else knows as ‘history’ nothing better than mere propaganda. Because these nations aren’t democracies today. If they were, then their mega-crooks would have gotten the maximum punishment, not accolades and an honored retirement. Given that reality, one can’t reasonably expect this news-report to be published by major ‘news’ media in the West, though it is being sent to all of them. Any which publish it deserve their readers’ support, for their serving the public, instead of serving the aristocracy that own the ‘news’ media. (1) Covert Action Information Bulletin #20, Winter 1984 (especially pages 35-36). (2) The Worldview of The Oligarchy in Guatemalan Politics (the 2003 Ph.D thesis by Roman Krznaric, especially pages 101 & 224).